It’s understandable that you might feel a bit anxious when you hear “root canal,” but with modern anesthetics you’ll rarely be in any pain and it is a necessary procedure to save your tooth. Below we answer some of the frequently asked questions associated with root canals. Underneath your tooth’s outer enamel and within the dentin is an area of soft tissue called the pulp, which carries the tooth’s nerves, veins, arteries and lymph vessels. Root canals are very small, thin divisions that branch off from the top pulp chamber down to the tip of the root. A tooth has at least one but no more than four root canals. 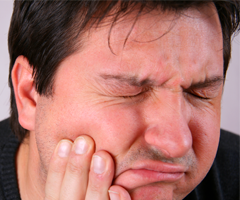 Why does a toothache cause pain? When the pulp becomes infected due to a deep cavity or fracture that allows bacteria to seep in, or injury due to trauma, it can die. Damaged or dead pulp causes increased blood flow, and this pressure cannot be relieved from inside the tooth. Pain in the tooth is commonly felt when biting down, chewing, or applying hot or cold foods and drinks. Because the tooth will not heal by itself. Without treatment, the infection will spread, bone around the tooth will begin to degenerate, and the tooth may fall out. Pain usually worsens until one is forced to seek emergency dental attention. The only alternative is usually extraction of the tooth, which can cause surrounding teeth to shift crookedly, resulting in a bad bite. Though an extraction is cheaper, the space left behind will require an implant or a bridge, which can be more expensive than root canal therapy. If you have the choice, it’s always best to keep your original teeth. 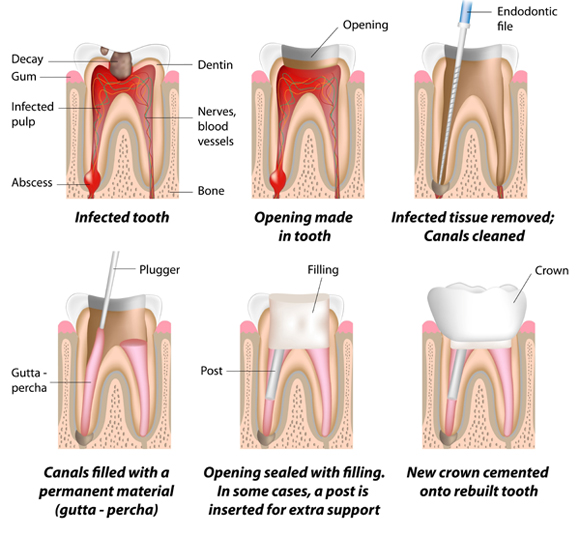 What is involved in root canal treatment? First, you will probably be given a local anesthetic to numb the area. A rubber sheet is then placed around the tooth to isolate it. Next, a gap is drilled from the crown and any affected tissue is cleaned and reshaped. Medication may be inserted into the area to help fight bacteria. Depending on the condition of the tooth, the crown may then be sealed temporarily to guard against recontamination, or the tooth may be left open to drain, or we may go right ahead and fill the canals. If you’re given a temporary filling, it’s usually removed at the next visit and the canal(s) are filled. Once filled, the area is permanently sealed and a gold or porcelain crown is placed over the tooth to strengthen its structure and improve appearance. Swelling may cause discomfort for a few days, which can be controlled by an over-the-counter pain killer. A follow-up exam can monitor tissue healing. From this point on, brush and floss regularly, avoid chewing hard foods on the treated tooth, and see your dentist regularly. See a more detailed list of instructions on our post treatment care page. ©2015 Buchanan Family Dentistry. All rights reserved. Design and marketing by Deploy Dental.